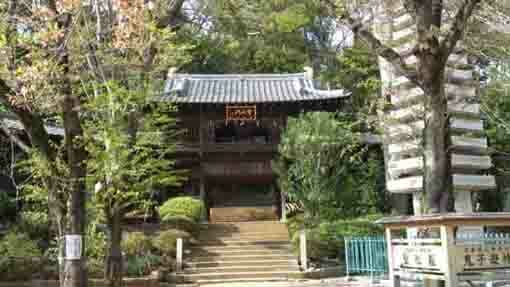 The Oku-no-in of Nakayama Hokekyo-ji Temple is the place where the founder Nichiren first preached to people. 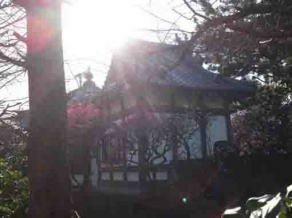 And the first abbot of Hokekyo-ji, the venerable Nichijo built here Hokke-ji Temple. Benzaiten is dedicated at the Oku-no-in as a member of the seven gods of good fortune, and on the tourist guide plate there, it is explained that she might have somthing related to Ugatokushoshin dedicated at the Ugajin-do behind the Soshi-do. 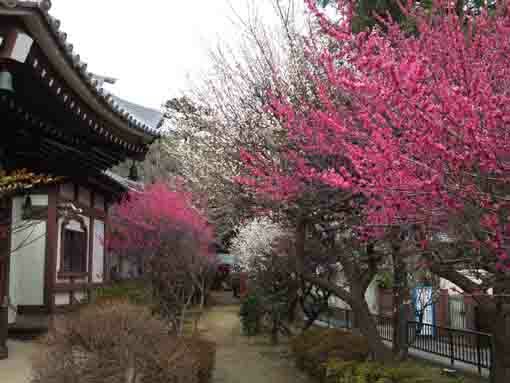 Moreover, there are many plum trees in the temple and the white and red plum blossoms bloom beautifully in Febraury. 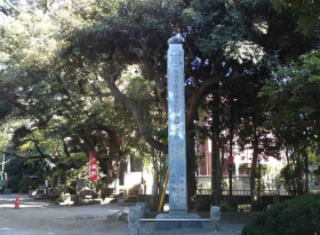 When the founder Nichiren got fired at Matsubagaya in Kamakura in Sagami-no-kuni (Kanagawa Prefecture) by the government of the Kamakura Shogunate in 1260, he escaped to Wakamiya and asked Jonin to help him. 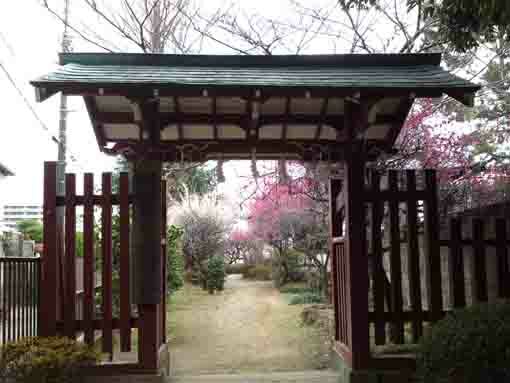 Then Jonin Toki built the Hokke-do in his castle for him to stay and he asked Nichiren to teach him. 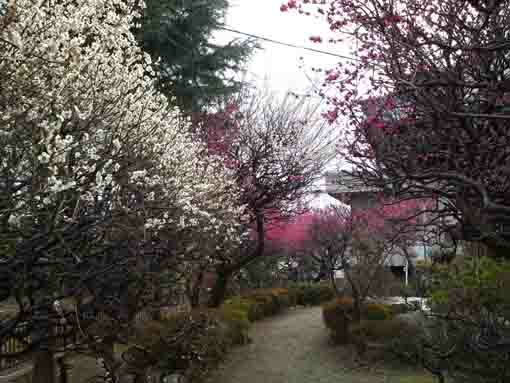 And also he came again when he had been attached by Kagenobu Tojo at Komatsubara in Awa-no-kuni (southern Chiba prefecture) in 1264. 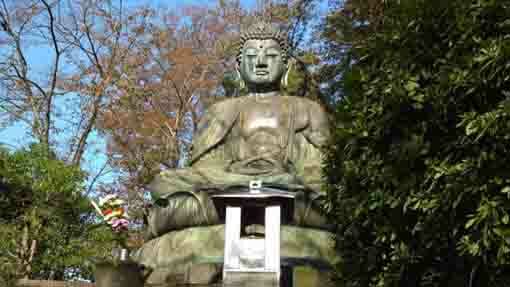 It is said that the founder Nichiren had given his sermon about a hundred times at the Hokke-do in Wakamiya. 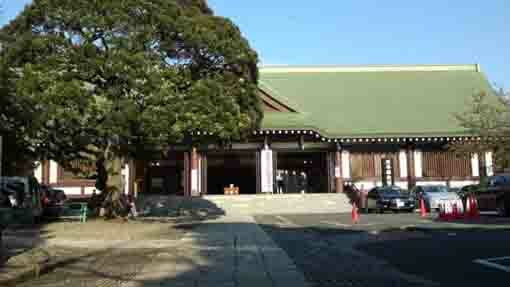 Therefore, Oku-no-in is the place where Nichiren first preached to people. 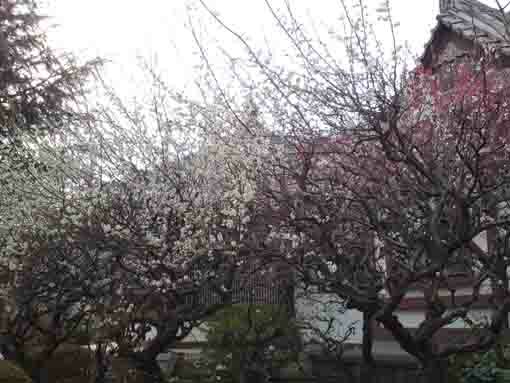 And there are many myths of the Nichiren and his supporters, Noriakira Ota in Nakayama, Norinobu Soya in Soya in Ichikawa and so on. 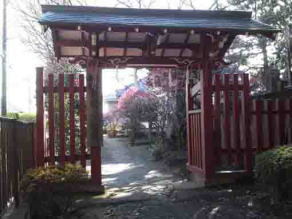 After Nichiren had passed in 1282, Jonin Toki became a priest and named Nichijo, then he made the Hokke-do Hokke-ji Temple. Hokke-ji Temple united Honmyo-ji Temple in Nakayama to be Hokekyo-ji Temple, and Hokke-ji has been called 'Oku-no-in' since then. 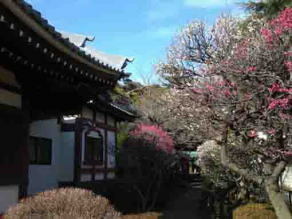 Then Nichijyo became the first abbot of Hokekyo-ji. 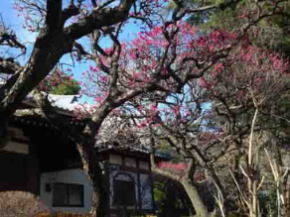 The thickly growing trees on piled soil is a part of the structural remnant such as the earthwork surrounding the castle at Wakamiya in their ages. 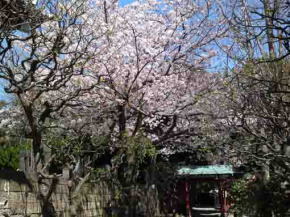 Therefore, it was called 'Wakamiya Yakata Ato' (the ancient site of the castle at Wakamiya). 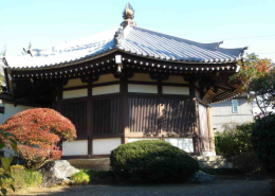 According to Edo Meiisho Zue, the founder Nichiren carved Isson-Yon-Bosatsu (bodhisattva) at Oku-no-in, and the twelfth abbot, the venerable Nikko built a Kyozuka (a mound of Buddhist Scriptures) for ten thousands Lotus Sutras there, and the statue of the founder Nichiren curved by the venerable Nippo was dedicated. Benzaiten is only a female god in the members of the seven gods of good fortune, and she is originally a goddess in the Indian myth, Sarasvati (called in Sanskrit), she is a wife of Brahma and the goddess of large rivers. 'Sarasvati' is feminin noun, means 'one who has water', so she is the goddess of music, knowledge since it comes from water flowing. 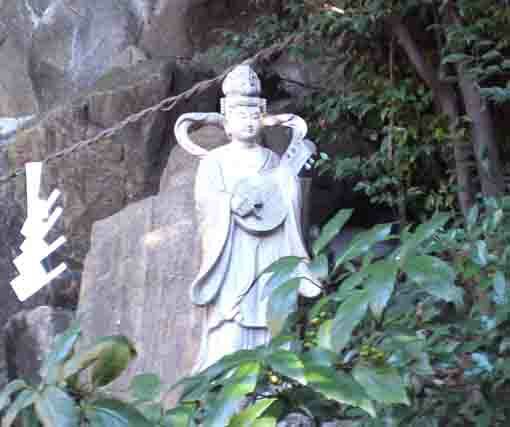 Sarasvati is first called Benzaiten in Japan and also introduced as a goddess of knowledge. 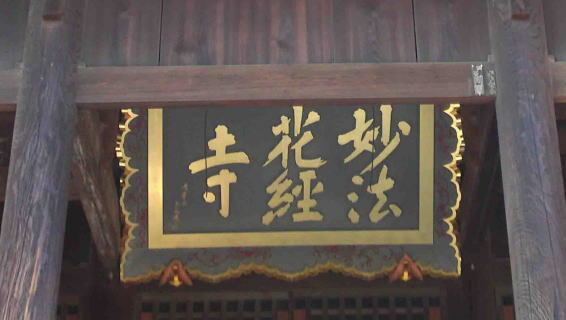 In Buddhism, Benzaiten appears on 'konkomei saisyo ou kyo' (the Golden Light Sutra of the Most Victorious Kings) at first, and it says that she gives knowledge, wealth and long life to people who preach and listen to the sutra. Howvere, she had often worshipped as a goddess of skills, and she united and mixed with Ichikishimahime-no-mikoto, therefore her statues are generally painted white in her skin with crown on her head and with biwa harp on her arm. After the middle Ages, Benzaiten has been worshipped as the god of property and she has become a member of the seven gods of good fortune. 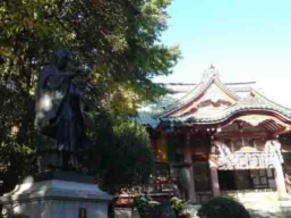 It is told that Benzaiten has the miraculous virtue of knowledge, property, charm and matchmaking. 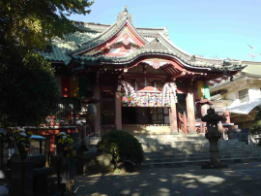 Benzaiten has been dedicated on the different side of Ugatokushoshin since the ancient times. 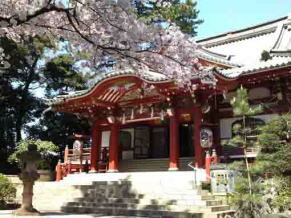 Therefore Ugatokushoshin in Nakayama Hokekyo-ji Temple might be dedicated on the different side of Benzaiten as it had been built. 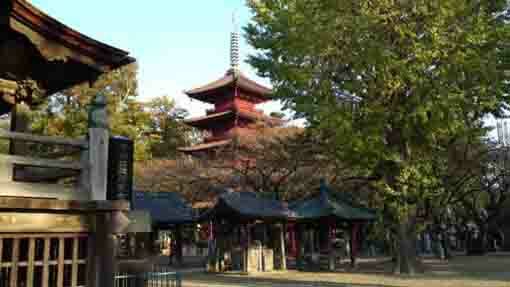 There are thousands of visitors come to pray it as Benzaiten is famous for fulfillment of their wishes. 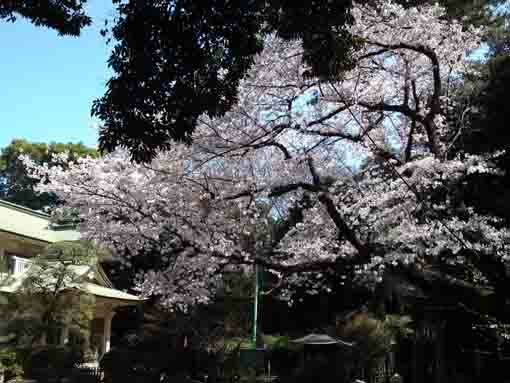 Nakayama Oku-no-in has a great accessibility from both Narita and Haneda International Airport. 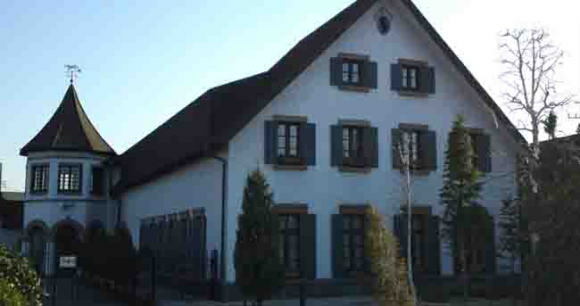 Take 10 minute walk from Keisei-Nakayama Sta, and take 15 minutes walk from Shimousa-Nakayama Sta. 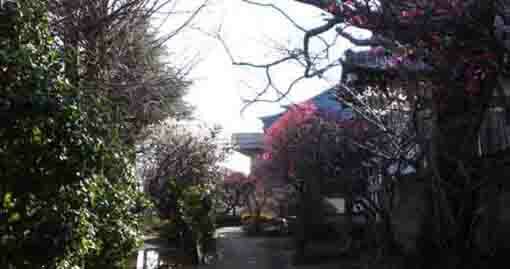 From Nakayama Hokekyo-ji Temple, climb up the road on the east side of it for 5 minutes, you could find bakery on your left at the cross, then turn to right and walk for a minute, there is Oku-no-in on your left. 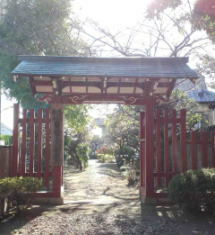 And turn to left and walk 50 meters, there is a gate of Oku-no-in.